Gold Medal Hairstyling requires a designer to be extremely knowledgeable and technically advanced in all areas of hair color, cutting and makeup artistry. What this means to you is that she is capable of designing an image that is individual to your hair type, body shape and lifestyle. From pool days to formal events, from a baby's first haircut through timeless beauty. Ruth is well versed in all hair types. 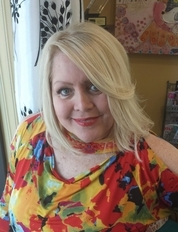 Ruth is known as a platform artist and a member of the National Education Committee, Hair America. Extensively trained privately with Ann Bray, International Hairdesigner of the Year with William Deridder, International Platform Artist and Educator. Ruth has traveled nationally as an educator and trained designers to the stars. She has judged State and National Hair and Makeup Competitions. Throughout Ruth's career she has styled political figures, sports celebrities and news anchors. She has styled fashion show and runway models, as well as her hair styles have been featured in Cosmopolitan Magazine. Ruth keeps herself educated on the most current trends and products. She is comfortable cutting either long, short hair, or coloring chocolate or blonde hair, styling fine/limp or frizzy hair. Ruth has 35 years of fashion forward expertise.